An academic from the University of New England is to be given one of our closest neighbour’s highest honours when he is awarded the Order of Timor-Leste next week. Associate Professor Bob Boughton from UNE’s School of Education is to be recognised for his “contribution and support of Timor-Leste’s self-determination struggle,” particularly through his work in promoting and providing widespread literacy programs throughout the nation. A/Prof. Boughton will be one of 35 organisations and individuals to be recognised on May 20, which marks the 13th anniversary of Timor-Leste’s Restoration of Independence Day. His wife, Deborah Durnan, will also receive the prestigious award. 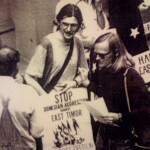 A/Prof Boughton became involved in the solidarity movement for the independence of what was then Portuguese Timor in early 1975, and continued to work closely with the FRETILIN independence movement throughout the 1980s and 1990s. In 2006 he began working with the Cuban education mission in Timor-Leste on a national adult literacy campaign, which has now taught basic literacy to over 200,000 people using local, village-based facilitators. From 2007-2009 he led an ARC-funded Linkage Project undertaken in partnership with the Timor-Leste Ministry of Education to assist the development of the country’s post-conflict adult education system. A/Prof Boughton says he is honoured but also humbled to receive this award. “The Timorese themselves gave so much for their independence, while we did so little in comparison,” A/Prof Boughton said. A/Prof Boughton continues to support Timorese students to undertake studies both in East Timor and in Australia, and he serves as an Honorary Assistant Director of the Centre for Peace and Conflict Studies at the National University of Timor-Leste (UNTL).